Have a blast while making up to 6 Fused Glass Holiday Ornaments in this fun-packed class. We'll put out all the glass and materials needed; you just create. 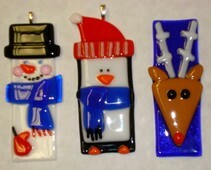 Select from 3 dozen designs; snowman, penguin, elf, tree, holly and much more. Students will purchase bails for hanging and attach after class. Experienced glass cutters, bring cutting tools (no oil in glass cutters!). Bring mosaic cutters if you have them. $95 Includes glass and kiln firing. Accessory glass available for purchase.